FISLY ( The Federation of International Sand and Land Yachting www.fisly.org) is the internationally recognised world governing body for all sand & land yachting as well as kite buggy and land board since it was formed in 1962 .Ireland is a full member of FISLY since the late 70’s and the Irish Power Kite and Sandyacht Association ( IPKSA ) is the internationally recognised Irish Governing body for these sports. IPKSA initially started out as The Irish Federation of Land and Sandyacht Clubs in the late 70’s and Ireland was host to the 21st European Championships in 1983 which was held in Newcastle Co.Down. During the 80’s Irvine Campbell from Co.Antrim was President of FISLY and in May 2014 Alan Watson from Co. Meath was elected as FISLY President in keeping with Irelands long association with this international sports body. Alan is the first President of FISLY from outside mainland Europe in 25 yrs, In October 2018 Alan finished his term as FISLY President and was elected as Vice President of FISLY . In Sept 2018 FISLY was accepted by GAISF as an observer member ( Global Association of International Sports Federations ) who are recognised by the International Olympic Council. 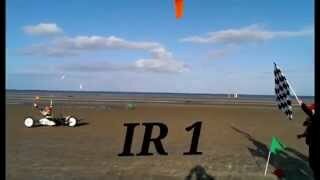 ( IPKA ) who once again hosted a European Championship in Ireland, this time the Class 8 (Kitebuggy) European Championships was held on Benone beach in 2005 . Each year without fail, IPKSA members representing Ireland in competitions abroad are approached and asked “when can we come to Ireland for an International event ?”, this is something that IPKSA would love to do again at some stage but the scale of such events is difficult for a small organisation to achieve but not impossible. The 2008 World Championships were in Argentina and the 2012 World Championships in France was attended by 320 competitors from over 20 countries and generated an estimated 6000 bed nights for the region over the week long event duration and was visited by 10,000 spectators ! 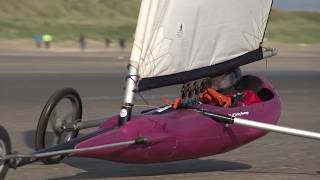 The 2014 Landsailing World Championships were held on Smith Creek Dry Lake in Nevada USA attended by 16 countries with over 300 people who were involved living on the dry lake for almost two weeks Over 30 miles from the nearest village! Ireland achieved two Bronze medals in the 2014 Championships our first World Championships in over 30 yrs and Colman Billings IR 219 won a race in class Manta Single. Our Kite Buggy Team of 3 won the FISLY Eurocup for Class 8 in 2015. In 2017 IPKSA organised and hosted the prestigious FISLY European Sandyacht Championships for 3 Classes on its first visit to the Republic of Ireland in its 55yr history ! The event was shared with Hoylake Liverpool who hosted a further 3 Classes. 120 competitors took part in the week long event held on Laytown and Bettystown Beach with the support of Meath Co.Council and many others. The Championships were a terrific success with fantastic racing on each day and a super atmosphere in the area with the event contributing almost 3000 holiday nights to the Irish economy. 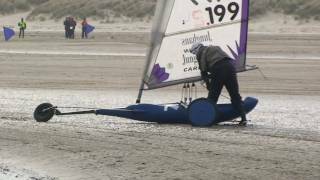 THE 2017 European Sandyacht Championships on Bettystown Beach in County Meath. A view of the action on Benone beach, where IPKSA organised the 2005 European Championships. 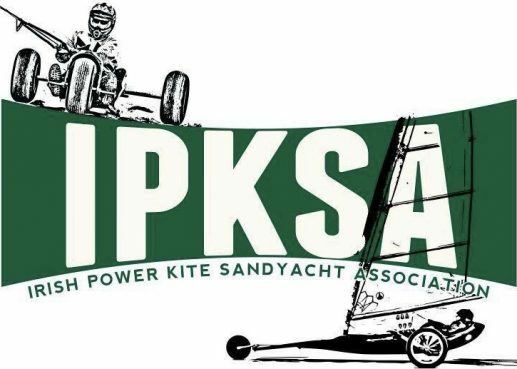 IPKA changed its name to the Irish Power Kite and Sandyacht Association ( IPKSA ) in 2007 to reflect better on the mix of the sport covered by the association. So Irelands pedigree within the International Land based Windsports community goes back many years and some of the original members from the original Irish Federation are still active members of IPKSA. The many years of International competitions and working with local authorities and organisations has brought a wealth of experience to the IPKSA members. IPKSA is a members association and represents its members locally and at International levels. IPKSA aims to assist in promoting safe practice of land based windsports and representing its members with local authorities and national organisations in an officially recognised capacity. Primarily IPKSA is about like minded people pooling their knowledge and resourcefulness to participate in and promote Power Kiting, Kite Buggying and Sandyachting in a safe family friendly and social environment which respects the needs and requirements of its members and other beach users. The IPKSA also frequently arrange for beach litter picks and offer our many years of expertise to local authorities when required to do so. Working together with County Councils and local authorities throughout Ireland North and South the IPKSA organises frequent beach events which attract a considerable following and bring a welcome boost to the sporting community and economies of the event area. See you on the beach or come and chat with us on the IPKSA facebook page !